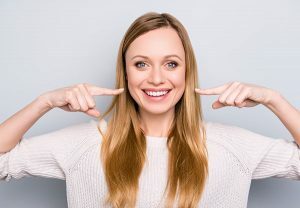 Esthetic dental bonding is a quick, easy, and inexpensive cosmetic dental procedure that can help repair and restore broken or discolored teeth, and close unsightly gaps in your smile. Dental bonding requires little preparation, no anesthesia, and is completed in just one visit. Esthetic dental bonding is a wonderful treatment option for patients with minor cosmetic flaws, or for patients who want to avoid the higher cost and commitment of braces and porcelain veneers. Unlike veneers, which are manufactured in a laboratory and require a customized mold to achieve a proper fit, esthetic dental bonding can be done in a single visit. Direct composite bonding uses natural tooth-colored composite material applied directly to the surface of the tooth that is then shaped and polished to match the surrounding teeth. At the beginning of your dental bonding procedure, your dentist will use a shade guide to select the composite resin color that most closely matches the color of your natural teeth. Once the proper color resin has been selected, your dentist will slightly abrade or etch the surface of the tooth. This increases the strength of the bond between your tooth and the resin. Then, a conditioning liquid primer will be applied to the tooth to prepare the surface for bonding. Finally, the resin is positioned on the tooth. Your dentist will then shape the resin to give it a natural look. Finally, the bond set with a light or laser and a quick round of polishing completes the process. It really is that simple! BONDING: SIMPLE, EASY, AND INEXPENSIVE! Bonding is among the easiest and least expensive of cosmetic dental procedures. The entire process can be accomplished in 30 to 60 minutes per tooth. Compared to veneers and crowns, dental bonding also requires less natural surface enamel be removed from the tooth. The average cost of dental bonding ranges from $300 to $600 per tooth, but insurance may cover some or all of the cost if the procedure is to restore structural integrity or as an alternative to filling a cavity. However, the resin material used in esthetic dental bonding is susceptible to chips and stains, and will need to be replaced in five to seven years. Cosmetic dentistry has certainly changed over the years, and today’s patients enjoy many treatment options. A consultation with your dentist will determine if esthetic dental bonding is the right choice for restoring your smile.